The Everett tungsten carbide band features a brilliant round black diamond solitaire in the center of the ring. The black diamond is set in a white gold bezel which contrasts nicely with the cool gun metal gray color of tungsten carbide. The high polish finish on this round profiled band reflects light nicely with the black diamond. 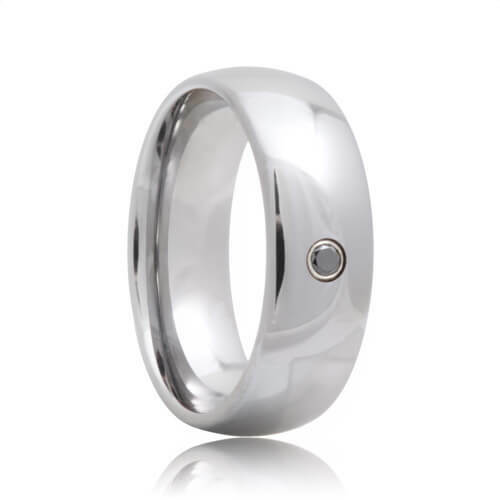 You will love the way these tungsten wedding bands will look on our finger. This style is made to order so please allow 5 - 10 business days to manufacture and ship. Free Lifetime Warranty and Lifetime Sizing; pay no restocking fees or deductibles! I am now a Tungsten Rings & Co. customer. When it comes to tungsten carbide ring shopping, it is a bit overwhelming because there are soo many other websites out there. Once I found Tungsten Rings & Co., I knew in an instant. This wedding band is fantastic!! I was a bit hesitant when buying because you can't see the ring and you can't try it on. The images on the site of this ring do not do it justice. The ring looks so much nicer in person than the picture. My fiancée and I are simply amazed at the quality of the ring. Working with the customer service team was great; you always know you are getting the best service. We had to send the ring back for a smaller size and there was no charge for the exchange. I simply adore the ring, it's beautiful and it was the best decision I made for our wedding. You will not be disappointed. Again, Tungsten Rings & Co.